Delicious savory pancakes recipe that everyone loves. 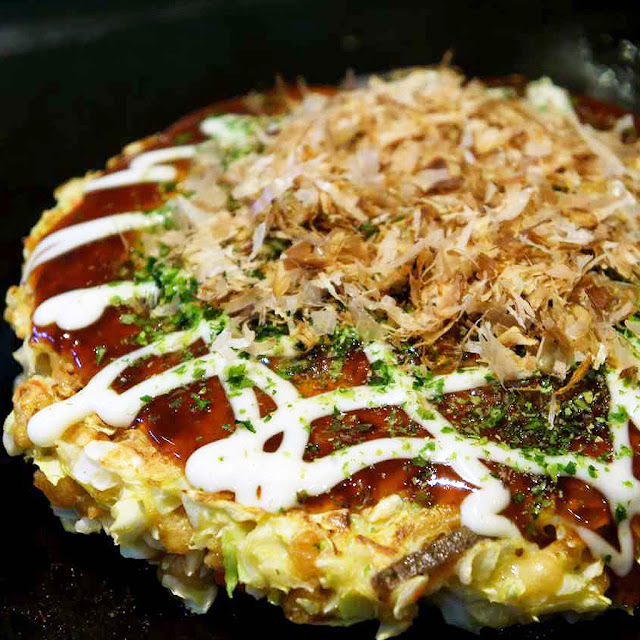 Try this traditional Japanese dish that's especially popular in Osaka. 4 leaves cabbage, washed and dried 2-4 stalks green onion 2 eggs 3/4 cup bonito flakes 1/4 pound sliced pork 2 tbsp deep fried tempura batter (tenkasu) 1 tbsp pickled ginger (beni shoga) 1 tbsp dried seaweed (aonori) 1/2 tsp dashi stock powder 1 cup water 1 cup flour okonomiyaki sauce mayonnaise. First chop the cabbage and green onions and set aside. Combine water with the dashi stock powder in a bowl and mix well. Add the flour and mix until no lumps. Add in the cabbage, green onions, deep fried batter, pickled ginger and eggs. Mix until ingredients are evenly distributed. Put some oil on a frying pan and add half the batter on. Flatten out into a circle. Place 3-4 slices of thinly sliced pork on top and cook for 2-3 minutes on medium heat. Flip it over. Cover and cook for another 3-4 minutes. Flip again and cook for a further 2-3 minutes. Transfer to a plate and pour on the okonomiyaki sauce and mayonnaise. Sprinkle on the aonori seaweed and a generous portion of bonito flakes. Tenkasu is really tough to get here in Montreal. I substitute Rice Krispies. The flavour is very similar and the texture is the same. For the meat, ( I cannot get the same cut of pork), I use smoked Polish pork loin. It's a little bit like Wiltshire bacon. Obviously, the taste does not measure up to the original but hey, you have to work with what you've got. As always, your comments are appreciated. Thanks! 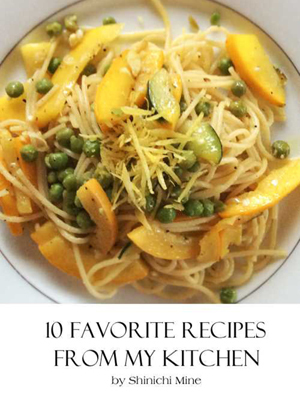 Subscribe and receive your FREE copy of 10 Favorite Recipes from My Kitchen!